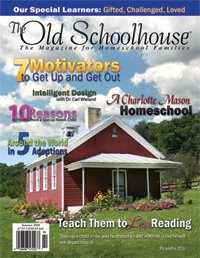 Homeschool Creations: The Old Schoolhouse Magazine Giveaway!!! Chance #1. Leave a comment on this post (or on the duplicate post on No Ordinary Moments blog). Please be sure to let me know how to get in touch with you - if you comment as "anonymous" it makes it a little difficult to find you. :) Leaving an email or blog address makes it much easier to find you. And an entry on both sites is perfectly fine...and each will count as a separate entry, so go visit my other blog too! This is a really great blog! I want to win this subscription! Looks great girl! Thanks for the heads up. I wish I had time to post or spread the news...but I appreciate you thinking of me. I'd love to win this for our first year! I would love to win this prize!! Please enter me in your contest. I cam over there from Homeschool Share Yahoo Group. Thanks for posting about the contest, enter me please. I really love what I see here so far. What a great blog you have going.